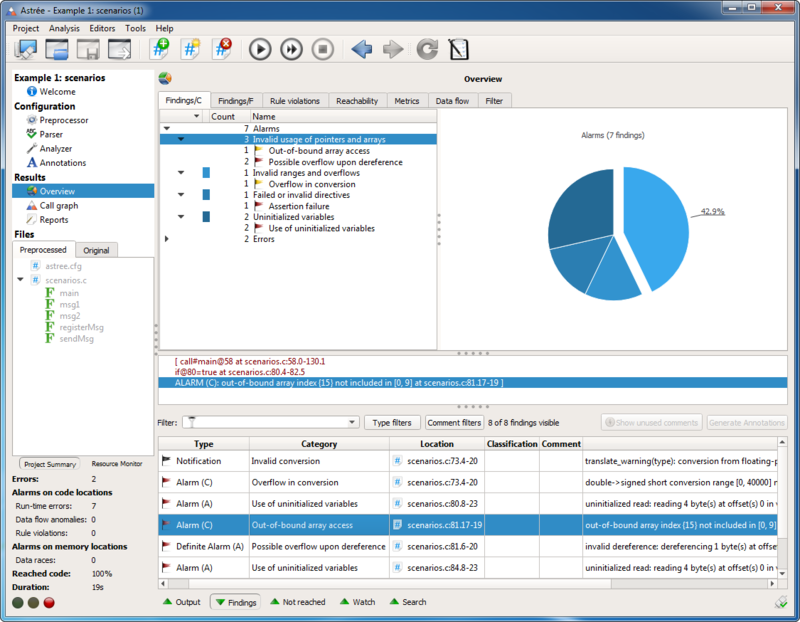 Astrée is a static code analyzer that proves the absence of run­time errors and invalid con­current behavior in safety-critical software written or gen­er­ated in C.
Astrée primarily targets embedded applications as found in aero­nautics, earth trans­por­tation, medical instrumen­tation, nuclear energy, and space flight. Never­theless, it can just as well be used to analyze any structured C programs, handwritten or generated, with complex memory usages, dynamic memory allocation, and recursion. Astrée is sound — that is, if no errors are signaled, the absence of errors has been proved. Which runtime properties are analyzed by Astrée? Astrée analyzes whether the C programming language is used correctly and whether there can be any run­time errors during any execution in any environment. This covers any use of C that, according to the C99 standard, has undefined behavior or violates hardware-specific aspects. Additionally, Astrée reports invalid concurrent behavior, violations of user-specified programming guidelines, and various program properties relevant for functional safety. code it can prove to be unreachable under any circumstances. Astrée is sound for floating-point computations and handles them precisely and safely. All possible rounding errors, and their cumu­lative effects, are taken into account. The same is true for −∞, +∞ and NaN values and their effects through arithmetic calculations and comparisons. The seamlessly integrated RuleChecker lets you check your code for compliance with MISRA, CWE, ISO/IEC, and SEI CERT C coding rules. You can easily toggle individual rules and even specific aspects of certain rules. The tool can also check for various code metrics such as com­ment den­sity or cyclomatic complexity. Custom extensions for your own in-house coding guidelines are available on request. Using RuleChecker in conjunction with the sound semantic analyses offered by Astrée guarantees zero false negatives and minimizes false positives on semantical rules. No standalone MISRA checker can offer this, and no testing environment can match the full data and path coverage provided by the static analysis. In 2003, Astrée proved the ab­sence of any run­time errors in the primary flight-control software of an Airbus model. The sys­tem’s 132,000 lines of C code were ana­lyzed com­pletely automatically in only 80 minutes on a 2.8GHz 32-bit PC using 300MB of memory (and in only 50 min­utes on an AMD Athlon 64 using 580MB of memory). Since then, Airbus France has been using Astrée in the devel­opment of safety-critical software for vari­ous plane series, including the A380. In 2008, Astrée proved the absence of any run­time errors in a C ver­sion of the auto­matic docking software of the Jules Verne Automated Transfer Vehicle (ATV), enabling ESA to transport payloads to the Inter­national Space Station. This was the first fully automatic docking maneuver not per­formed by a Rus­sian vessel. The global automotive supplier Helbako in Germany is using Astrée to guar­antee that no run­time errors can occur in their elec­tronic control software and to de­monstrate MISRA compliance of the code. Framatome employs Astrée for verification of their safety-critical TELEPERM XS platform that is used, among other things, for engineering, testing, commissioning, operating and troubleshooting nuclear reactors. MTU Friedrichshafen uses Astrée to demonstrate the cor­rectness of con­trol software for emer­gency power gene­rators in power plants. Together with its quali­fication package, Astrée is part of the IEC 60880 certi­fication process. A world leader in motors and ventilators for air-conditioning and refrigeration systems, ebm-papst is using Astrée for fully automatic conti­nuous verification of safety-critical interrupt-driven control software for commu­tating high-efficiency EC motors for venti­lator systems. 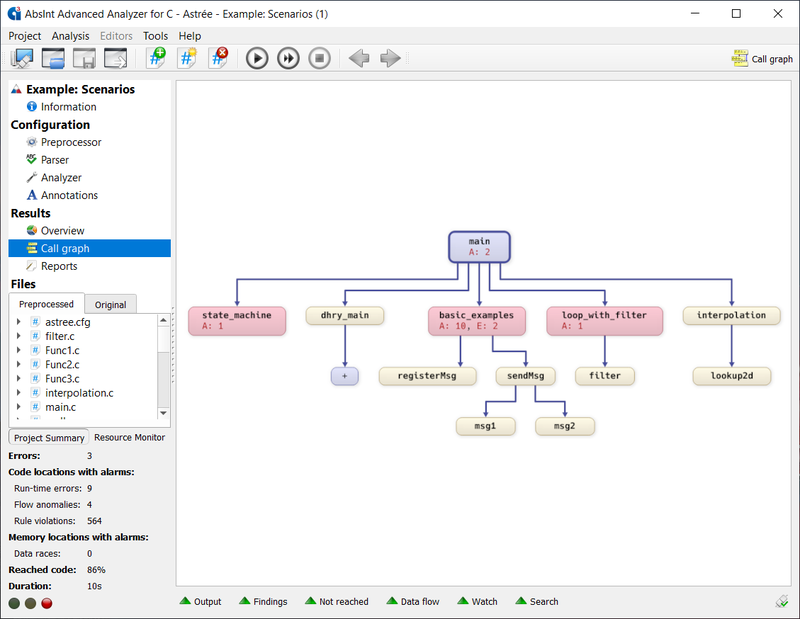 Astrée offers powerful annotation mechanisms for supplying external knowledge and fine-tuning the ana­lysis precision for individual loops or data structures. Detailed messages and an intui­tive GUI guide you to the exact cause of each potential runtime error. Actual errors can then be fixed, and in case of a false alarm, the analyzer can be tuned to avoid it. This allows for analyses with very few or even zero false alarms. Seamless integration with TargetLink, Jenkins, and Eclipse is actively supported. Most static analyzers do not consider all possible run­time errors. Others specifically focus on the most probable ones. As a result, almost all competing tools can only be used for static testing (i.e. finding some frequently occurring bugs), but never for verification (i.e. proving the absence of any run­time errors). In contrast, Astrée is sound. It always exhaustively considers all pos­sible run­time errors. It will never omit pointing out a potential run­time error. This is crucial for verification of safety-critical software. At the same time, Astrée is capable of producing exactly zero false alarms. Certain static analyzers (e.g. those relying on theorem provers) require programs to be annotated with lots of inductive invariants. Many analyzers cannot be scripted at all. Others can, but won’t let you access their analysis results outside of their proprietary viewer. This actively prevents you from automating the analysis, e.g. as part of your nightly build process. Many static analyzers have high computational costs (typically sever­al hours of compu­tation per 10,000 lines of code). Others terminate out of memory, or may not terminate at all. In contrast, Astrée is efficient and easily scales up to real-world pro­grams in industrial practice. As an example, in order to ana­lyze actual flight-control software with 132,000 lines of C code, even on a slow 2.8GHz PC Astrée takes a mere 80 min­utes. Faster machines will get you faster results. Multi­core parallel or distri­buted computation is supported. General-purpose static analyzers aim at analyzing any application written in a given pro­gram­ming language. They can rely on language related properties to find potential run­time errors. Specialized static analyzers put additional restrictions on the app­lications so as to be able to take specific program structures into account. In contrast, Astrée is domain-aware. It thus knows facts about ap­pli­ca­tion domains that are indispensable to make sophisticated proofs. For example, for control/command programs, Astrée takes the logic and functional properties of control/command theory into account. In static program analysis, there is always a trade-off between analysis precision and analysis cost. Analyzers that are precise are usually also very slow, while fast analyzers usually lack precision. Astrée consists of several modules (so-called abstract domains). These modules can be assembled and parameterized to build application-specific analyzers that are fully adapted to a particular ap­plication domain or specific end-user requirements. In case of false alarms, Astrée can be easily extended by intro­duc­ing additional modules that enhance the precision of the analysis. General-purpose static analyzers usually suffer from low precision in terms of false alarms, i.e. spurious warnings about errors that can actu­ally never occur at run­time. The ratio of false alarms to the number of basic C operations typically ranges between 10% and 20%. Specialized analyzers achieve a better precision of 10% or less. How­ever, even a very high selectivity rate of only 1 false alarm for every 100 operations is usually unacceptable for large real-world appli­cations. For example, on a program with 100,000 operations, a selec­tivity rate of only 1% yields 1000 false alarms. In contrast, thanks to its modularity and domain-awareness, Astrée can be made exceptionally precise, often to the point of pro­ducing exactly zero false alarms. This has been repeatedly proven in indus­tri­al practice, e.g. when analyzing primary flight-control software for Airbus. Major new releases are published twice a year, intermediate releases more often still. If you have a feature request, let us know at support@absint.com. © АбсИнт. Astrée is developed and distributed by AbsInt under license from the CNRS/ENS.